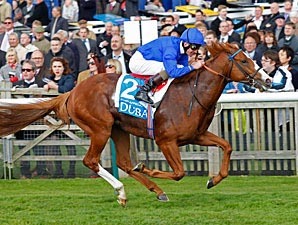 Dawn Approach is a red-hot favourite for the Derby at Epsom following his impressive five-length victory in the 2000 Guineas at Newmarket. The colt had only been supplemented for the Derby a few weeks prior to the Guineas and there are question marks about his ability to stay the extra half a mile. Trained by Jim Bolger in Ireland, Dawn Approach was purchased by Sheikh Mohammed after winning the Coventry Stakes at Royal Ascot last summer. He went on to prove himself the champion two-year-old with an easy victory in the Dewhurst Stakes. The form of his Guineas win is suspect with a 150-1 outsider having finished second and the third horse having been well beaten in Ireland since. The Irish 2000 Guineas was won by Magician for Aidan O’Brien and a decision on whether or not he runs will be taken later in the week. He was a surprise runner at the Curragh but landed a big gamble from 14-1 into 100-30. He had previously looked a possible Derby colt when winning over a mile and a quarter and Chester. O’Brien has six possible runners including Leopardstown winner Battle Of Marengo and Chester Vase winner Ruler Of The World. Neither was particularly impressive in their most recent trials but the trainer has no concerns over their ability to stay the distance. Frankie Dettori is thought to be in line for the ride on Ruler Of The World providing that he is allowed to return from his ban in time for the meeting. Mars is another possible runner for O’Brien but will need to improve considerably on his effort in the Guineas behind Dawn Approach. French trainer Andre Fabre won this race with Pour Moi in 2011 and is represented by Ocovango. He has been trained specifically for the race and looks guaranteed to stay the trip. Chopin represents Germany and was supplemented for the race this week following some easy victories on home soil. He has won his last two races by an aggregate of 17 lengths but is stepping up in class here. There appears to be a dearth of talent in England this year and the only realistic prospect of a successful home defence is shock York winner Libertarian. He was 33-1 when winning the Dante Stakes but saw off some better fancied rivals to book his place in the line up. The other feature race of the week is the Epsom Oaks on Friday with the market headed by Lingfield winner Secret Gesture. She may not have beaten much that day but could not have been more impressive. Her biggest rival could be Guineas third Moth who stayed on powerfully that day and should appreciate the step up in trip. Some bookmakers are already going non-runner/no bet on both races including Bet365. They have priced Dawn Approach at Evens for the Derby with Battle Of Marengo at 5-1 and Magician at 6-1.